Okay, so you know how I told you we were planning to run in the Big Peach 5K on Saturday morning at 8 a.m.? 7:25 on the interstate stuck in traffic, paving road, AGAIN! My friend Jodi, who is our "5K planner and organizer", has decided we'll do another race on September 11 in Villa Rica. I think it will be great and can't wait. I was so close to the 45 minutes and I really want to beat the 45 minute mark! Oooo...you are triggering my road rage just thinking about that! Congrats on completing the race! I know your a little disappointed to not have started at the actual starting line, but you DID participate in the race, no matter where you started. Way to go!! I've done a few 5k's in my day and even running I never did do better than 30 minutes I am a super slow jogger. So glad you didn't give up even though the circumstances and pushing a stroller, awesome! Congratulations on finding your friends and doing the race..that's awesome. Of course, it sure helps to have cute little cheerleaders! 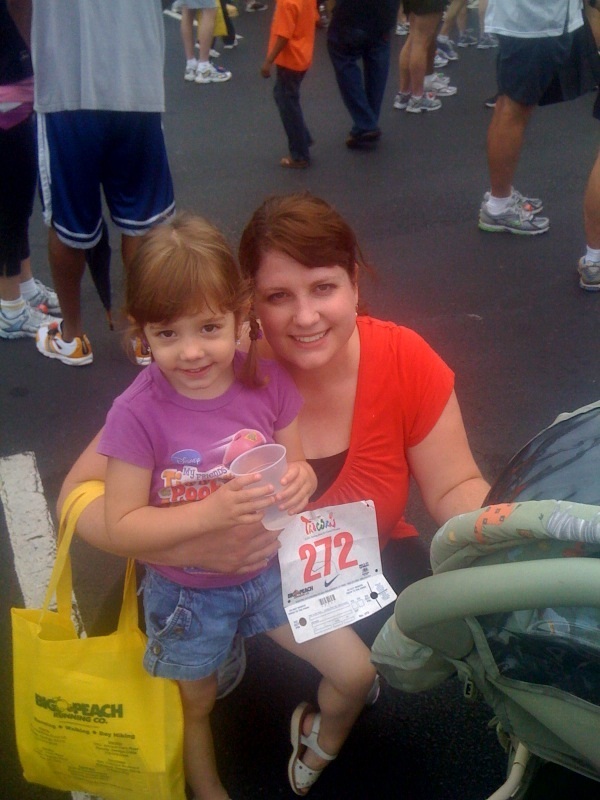 I would love to see a big mommy and me 5k where everyone is pushing strollers. so you'll be coming to my town in sept? at the gold rush festival? awesome. my husband does the 5k's in our family. he did one where he was pushing our older son in a jogging stroller and all he kept yelling was "faster daddy, faster" lol. congrats on participating in your run. that's just awesome!! You did awesome girl! Congrats! You had a stressful morning and you should be proud of your accomplishment! Way to go. What a cute photo of you and the kiddo too! I know you'll do even better at the next one! I think it's great that you do so much. You're a lot like me.... a regular Renaissance woman and mom! Think about all the great things you do on a daily, weekly and monthly basis. You're amazing! :) P.s. - I mentioned you at the end of my last blog post to check out for strawberry recipes... I hope you don't mind. So if you see some increased traffic, comments on that post, you'll know why!